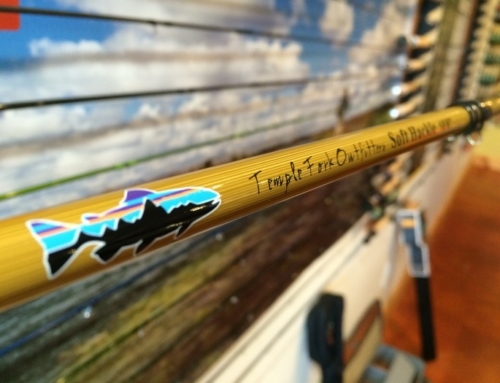 Catch more fish when you’re fishing a Dry Dropper. Here’s a simple dry dropper solution for one of the most common problems I’ve encountered when fishing droppers. Dropper tippets are typically tied off the bend of the hook. 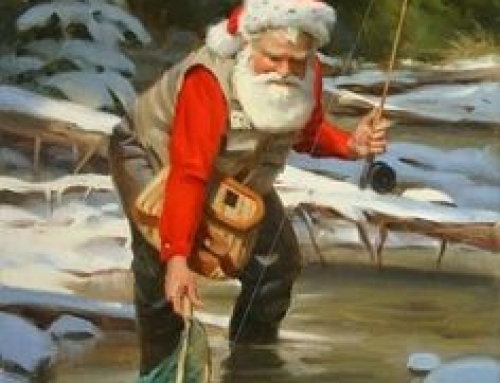 This is true whether fishing multiple nymphs or dry flies, or a combination of a dry fly with a nymph dropper. So the first fly in line, the one tied to the end of the leader, has a tippet tied onto its bend that leads to the second fly. 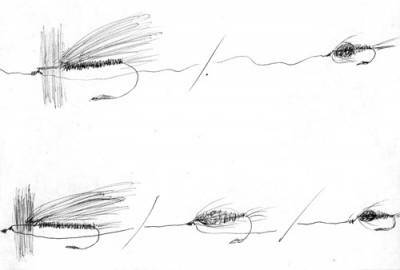 I’ve even seen three or more flies rigged this way in sequence, with each fly attached to a tippet which is tied onto the bend of the hook on the preceding fly. Here’s the problem. When a fish is hooked on the first fly, or any fly except the last one, it’s not unusual for the dropper fly to become snagged on something, especially with larger fish that you can’t steer away from obstacles. This results in the hook being pulled out of the mouth of the fish. You hook the fish, fight it for a while, then end up snagged on the bottom with no fish on the line. If you fish droppers much you’ve had this happen. It’s because the dropper tippet is attached to the bend of the hook so, when the dropper fly gets hung on something like a rock, it pulls the hook out as efficiently as grabbing the bend of the hook with your forceps. 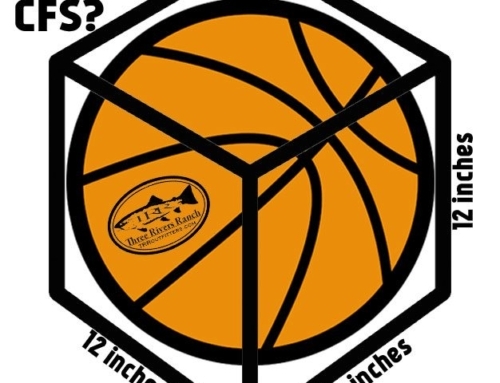 This is especially true with barbless hooks and you SHOULD be fishing barbless – there’s no good reason for fishing with barbed hooks. Fortunately solving this problem is easy. Simply attach the dropper tippet to the eye of the hook. 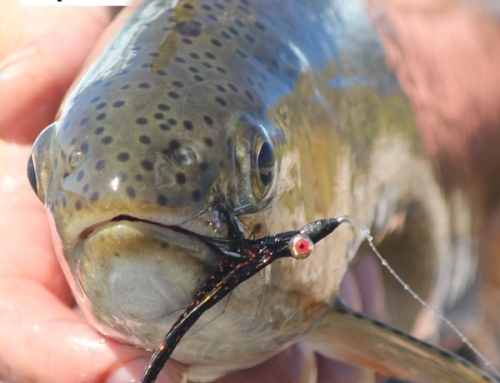 With all flies attached to their respective tippet(s) through the eye of the hook, as intended, the tippet of a snagged dropper will pull on the eye of the preceding fly rather than the bend. If the dropper is on a lighter tippet, which is often the case, you might break off the dropper fly but the fish will stay hooked and can still be landed. I’ve rigged droppers this way for many years and never ran into any problems as a result. You do everything the same as with a traditional rig off the bend, you just don’t lose so many fish. 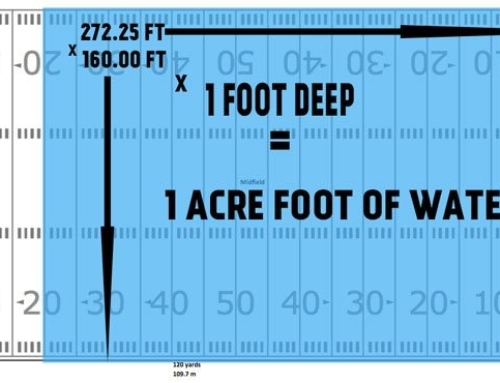 So next time you’re out give this a try and see for yourself. If you like landing fish you’ll never rig your droppers off the bend again.